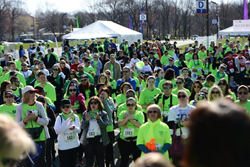 NJ Sharing Network is gearing up for its signature event of the year, the Annual 5K Celebration of Life, which attracts thousands of participants to New Providence each June to support its mission of saving and enhancing lives through organ and tissue donation. The event is a family-oriented day taking place Sunday, June 7, at NJ Sharing Network headquarters, 691 Central Ave. in New Providence. The event features music, awards, prizes, and activities for all ages, all to honor those who gave, pay tribute to those who received, offer hope to those who continue to wait, and remember the lives lost while waiting... for the Gift of Life. Gathered at this event will be donor families, transplant recipients, living donors, those waiting for a transplant, volunteers, elected officials and hospital, community and corporate sponsors. To date, more than 266 teams that have signed up to participate with more 50 more teams anticipated by event day. Glennon noted that this year the 5K Celebration of Life event expanded to two locations with the inaugural 5K Walk at Bergen Community College in Paramus on April 12 and the New Providence 5K Walk and USATF Race on June 7. To date the NJ Sharing Network Foundation has raised more than $650,000 in individual contributions and sponsorships for the 5K Celebration of Life. Pfizer will serve once again as the presenting sponsor and collaborator of the 5K Celebration of Life in New Providence, while NJ Advance Media will serve as media sponsor. To sign up for the 5K Celebration of Life, to start or join a team, and to learn more about the event and sponsorship opportunities, please visit http://www.NJSharingNetwork.org.